Small Business SEO is a field that is constantly changing. Google updates its algorithms 500 to 600 times each year. As search engines update their algorithms, website owners and internet marketers must update their search engine ranking strategies. To improve SEO results in 2018, a small business will need to understand advanced and implement SEO strategies related to SERP features, RankBrain, Voice Search, Mobile-first Indexing, AMP, Structured Data, SSL, Video Content, and Content Marketing. Google’s search results pages used to be just a listing of websites plus PPC (pay per click) ads. Now there’s a lot more going on. There’s the Knowledge Graph, carousels, featured snippets, answer boxes, Google My Business page, and many new places that your small business website can appear in. Write Q&A content – Google often picks results that contain both the question asked in the answer box as well as its solution. Make sure you include both in your content. Use lists, tables, and graphs – These types of content are more likely to be used than just plain text. Add rich snippets and structured data – this means adding markup (code) that tells Google additional information about different parts of your content. To increase click-through rate, focus on improving SEO titles, URLs, and meta descriptions. Next, you can read our post on how to keep visitors on your site longer. People use speech to perform internet searches. In fact, as early as 2016, 40% of adults performed at least one voice search per day. Voice searches make up 20 percent of searches on mobile devices. These figures have probably increased by now thanks to the Internet of Things and Siri and Alexa. The first step in preparing for voice search should be to try and read your website content aloud. In 2016, Google announced it was working on a mobile-first index. That means, instead of looking at your website through the eyes of a desktop user, Google will start looking at it as the user of a mobile device. If the content is not optimized for mobile – meaning not accessible from a mobile device – it will be disregarded completely. 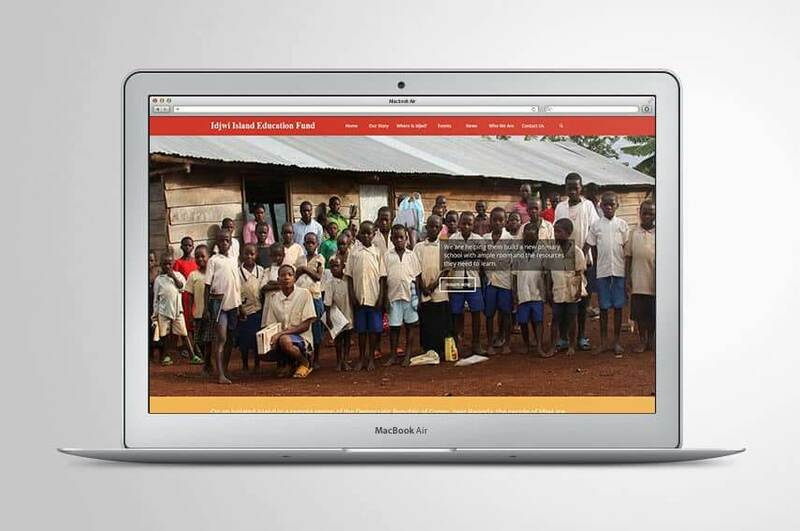 If you do not yet have a responsive website, it is now time for a redesign. Google has not yet said exactly when they will make the switch, but it’s important for small businesses to be prepared for this ahead of time. AMP is one of Google’s pet projects that aims to deliver search results to users even faster. While AMP is not an official ranking factor, it does drive traffic and thus rankings. Read our blog post about AMP for more information. Schema.org markup makes it easier for Google to understand the code and elements on web pages. That way, they are able to display more information in search results, including in the coveted spaces of the aforementioned SERP features. Not every website needs structured data. If you publish news, reviews, products and recipes, it’s advisable to add structured data on your site. According to TechCrunch, video content will make up to 80 percent of all web traffic by 2021. As a consequence, this is definitely an important part of Small Business SEO for 2018 and a reason to make visual content part of your marketing strategy. How to get your content to appear in a Google featured snippet? 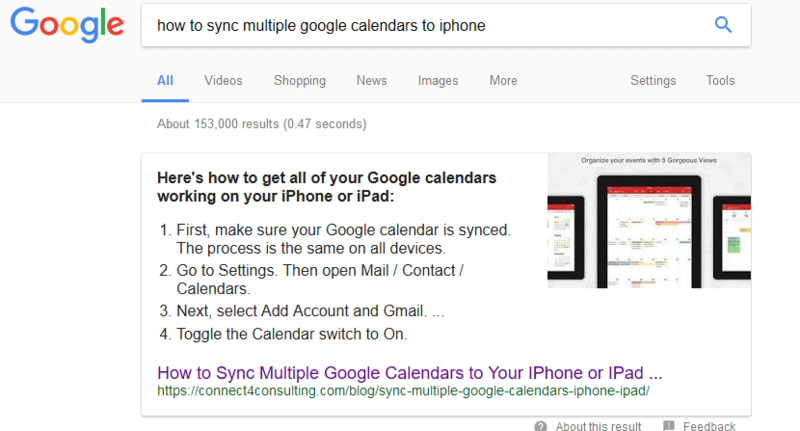 On the Connect4 Consulting website, the page with the highest traffic and ranking is a blog post I wrote in 2016 titled “How to Sync Multiple Google Calendars to Your IPhone or IPad.” I didn’t know it at the time, but I was answering a popular question that – at the time – didn’t have many straightforward answers. My answer is featured in a Google snippet and also one of the highest-ranked keywords on the search results page. https://connect4consulting.com/wp-content/uploads/2017/11/matt-artz-353291.jpg 531 801 Gabriel Seiden https://connect4consulting.com/wp-content/uploads/2013/04/Connect4Consulting_LO_FF_transparent1.png Gabriel Seiden2017-11-21 17:25:002017-11-21 17:28:55How to get your content to appear in a Google featured snippet? As you can see from this, Google’s featured snippet isn’t perfect. My question pertained just to the North East and only asked for the three most common trees. However, the point of the Google’s featured snippets is to provide the best answer to a user’s questions. 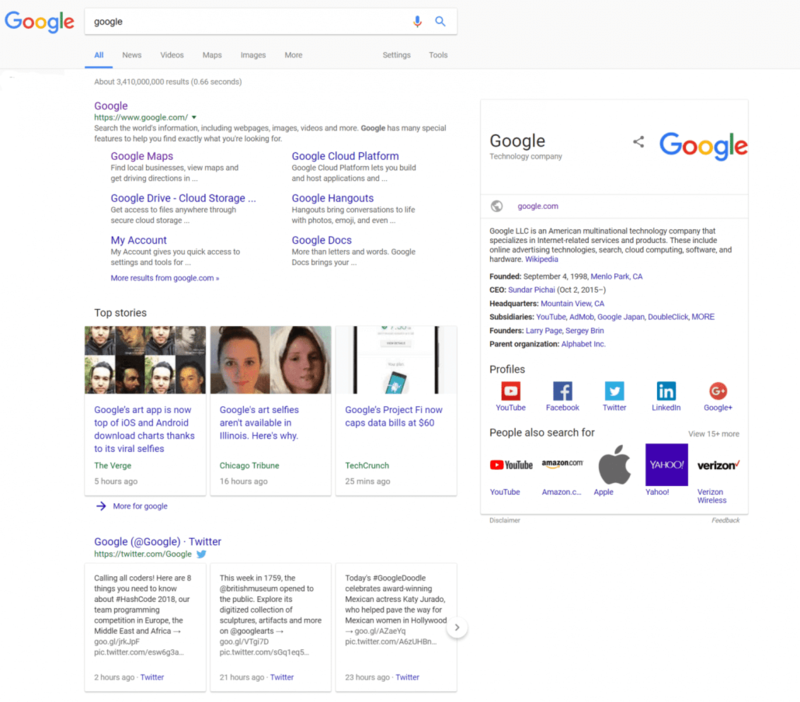 Google will display what they believe to be the best answer to the question, and they will feature this in a section above the ads and above the organic search results. Sometimes this will be a paragraph, or a list, or a table. 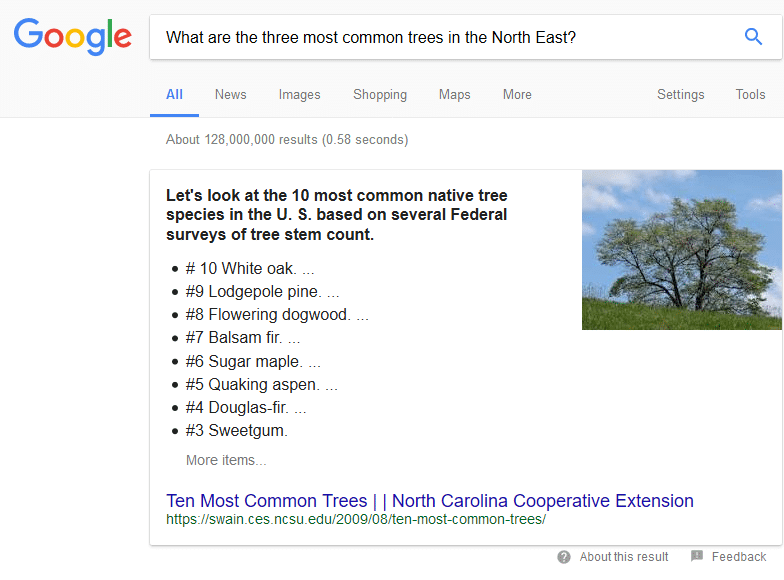 https://connect4consulting.com/wp-content/uploads/2017/11/Screenshot-2017-11-21-What-are-the-three-most-common-trees-in-the-North-East-Google-Search.png 580 784 Gabriel Seiden https://connect4consulting.com/wp-content/uploads/2013/04/Connect4Consulting_LO_FF_transparent1.png Gabriel Seiden2017-11-21 16:38:532017-11-21 16:38:53What is a Google featured snippet? When you are considering a website redesign, it is crucial you take SEO into consideration so the website does not lose current traffic or drop in the search rankings. Sometimes in the anticipation of a site redesign or migration, it can be easy to overlook important items and stay organized. I wanted to pass along what we have learned redesigning websites for clients and how you can make sure you are properly prepared when you’re faced with a site-wide redesign. Here are some questions to ask yourself / look into before launching a new website. What pages get the most traffic and referrals? Which pages receive the most back links? Will these top pages (found in #1 and #2) have a new URL? Are any pages being deleted? Is it necessary to delete these pages? What pages will the deleted pages be redirected to? What internal pages do the the deleted pages link to? Are the new pages that will receive the redirect relevant to the old page and target the same keywords? What changes are being made to the site architecture? How is the internal linking structure changing? What links are being removed from the main navigation, main menu and sidebar? Will content change on the existing pages? Will the current on-page optimization be carried over to the new site? Are the same images going to be used? 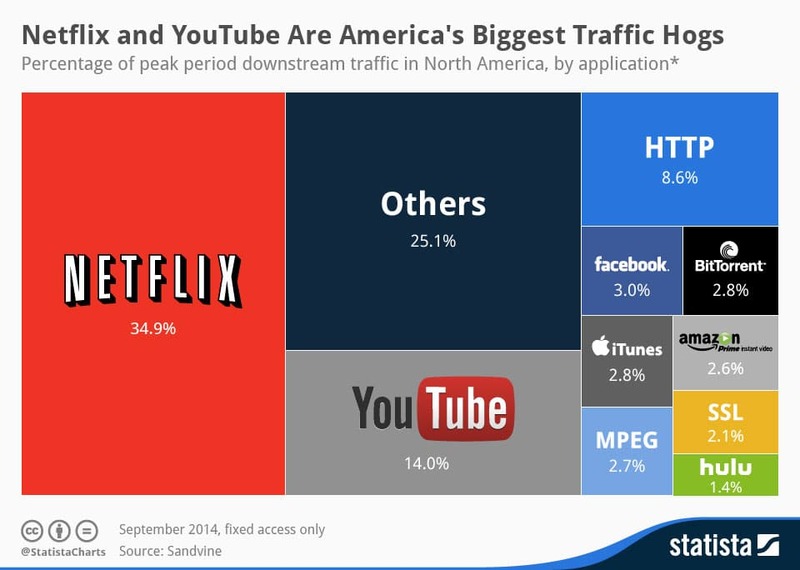 Do images currently refer any traffic? If pages are being eliminated during the redesign or if not all pages are being migrated over to the new site, you need to create a proper 301-redirect strategy. If you do not implement necessary redirects you run the risk of negatively impacting your site traffic. No matter how much you prepare, there is always a chance that some things will not go exactly according to plan. However, if you have the proper steps in place, like checklists, QA plans and other preemptive strategies, you will be more equipped to deal with issues that arise. Local SEO is a constantly evolving practice. What was very effective a few years ago is often no longer effective now. And in some cases, what was effective a few years ago will actually get you into trouble now. It is very important to stay up to date so you know the best practice for improving your local search results. Here are a number of local SEO tactics that are still quite common but I will dissect the SEO tactic and show you that there is a better way of achieving the same result. While url optimization does carry some SEO benefit, if a boost in local search results is your SEO goal, then it makes more sense to focus on using location-specific keywords throughout your site content and structure. It is much better to use a brand-led domain. Google likes it more and it conveys more trust because it doesn’t look spammy. Brand-led domains also make it easier for you to expand geographically. Think about it this way. If you have a region-specific domain, then you’re narrowing your business to one location. The best-practice approach is to use a brand-specific domain and then create localized landing page content. This approach builds trust and credibility, provides location-specific content, and doesn’t limit you to one geographic location. Region-specific Top Level Domains allow you to end your website domain with a specific geographic location. Like www.mylocalbusiness.boston. While this looks cool, Google confirms that it carries no additional SEO weight. The best practice Local SEO approach is to choose a brand-specific domain name and then build region-specific content in your website. Local doorway pages are similar to landing pages except for the key fact that landing pages are designed to funnel real visitors who search for a unique keyword and then “land” at your site and come in through a page that’s not the home page. Local doorway pages have urls like yoursite.com/plumber-washington. You can have a page like this if there is truly unique content on that page and it’s a page that’s part of the site structure. If you’re a small local business, it’s important to get links from small local directories and websites. From a local link building perspective, these are links from sites involved in your community, e.g. hotels, bed and breakfasts, city information, libraries, churches, etc. As long as these websites provide actual value to your local community, they will also bring inherent SEO value to your local business. Once indexed, these links will show Google that your business is actively involved in its surrounding community. Google My Business gives users the ability to set their radius of service around their physical address. This allows customers to see how far a business is willing to travel to visit a customer. Some business owners set their radius to its maximum in the hope of ranking across several locations. Unfortunately, this doesn’t work and you’re still only likely to rank around the actual, physical location of your business. The radius setting should be used realistically & needs to accurately show the area of your business. If a huge service area is correct then that’s fine, just don’t expect any cross-location ranking boost to come from it. The reality is that if you want to rank across several locations and make the most of local SEO, you need a physical site in each major city that’s actually used and occupied by your team. I hear it all the time: “My website or budget is too small for SEO.” “We don’t have the traffic…no one ever visits our site.” Believe it or not but you should spend time on SEO especially if no one visits your site. SEO for small websites is even more important than SEO for big websites. The whole point of SEO is to make your website more visible. If you’re not doing SEO, your visibility isn’t increasing. Think about it – doing just a little SEO could mean the difference between having 0 visitors and having a few warm leads from your site. Here’s how to do SEO for small websites with little to no traffic. Develop a content strategy – most small sites hesitate to create a content strategy because they think it’s too much work. It takes some work and advance planning, but it’s well worth it. In today’s world, people want answers – people are seeking authoritative answers to their questions. Do you ever turn to Siri for the answer to a question? Where do you think these answers come from? They come from people who create website content. Research long tail keywords. Plan ahead of time and try to publish two blog posts a week. Branch out to different content types. Share your content on all the big social networks like Facebook and Twitter. If you’re part of a niche group – like therapists – consider smaller social networks and niche sites. Nurture a following – marketing is interactive. Brands engage customers through social media and many top bloggers have ongoing conversations in the comments section. You need to identify your audience, build a solid value proposition, and then build your audience through guest posting and paid advertising. Optimize your site for mobile – truly optimizing a website for mobile devices is more than creating a mobile version. You have to change a lot but start with page speed. You don’t need a huge website to get some of the best SEO results. Follow my tips for how to do SEO for small websites and your website will become more visible. The lesson is that it’s never too early or too late to learn the basics. The Google 2-pack (which is Google’s organic listing of two local businesses) appears at the top of 93 percent of all searches with local intent. 60 percent of American adults search for local product and service information. 50 percent of people who conduct a local search on their Smartphone, and 34 percent of people who conduct a search on their computer/tablet, will visit a store within a day. A whopping 46 percent of all searches on Google are local. NAP stands for Name, Address, and Phone Number. NAP information is one of the core metrics Google uses to rank local businesses in its search results. Not only is it important to have your NAP information publicly and prominently displayed on your website, but it is also important that this information is consistent. Several sources agree that Google and other search engines cross check your NAP information with several other sites — this includes on your Google My Business page, Yelp, Internet Yellow Pages, and local directories. This tool from Moz can help analyze your website to see if you will have any issues. One of the most important things you can do when trying to rank well in local SEO, specifically with the Google search engine, is to claim your Google My Business page. When it comes to local SEO, the information Google uses to rank your website — and that it displays to people in local results — mainly comes from your My Business page, not from your website. You can set up your My Business page directly with Google, but it is important to verify your listing so that nobody else is able to edit your page in the future. Once you set up your My Business page, it is important to ensure it includes a proper and unique description of your business, that your business is properly categorized, that there are a local phone number and address accompanying your listing and that is consistent elsewhere online, and that you upload as many relevant photos for your business. The more high quality, high quantity and high diversity reviews you get, the better for your local SEO. For a start, once your My Business page has been created, reach out to existing customers and friends, reach out to people on your email list, reach out to people through your blog, who have experience with your business and ask them to leave a genuine review — you could even give them the incentive to leave a review. Having your business listed in an incorrect category in your My Business page can have a negative impact on your local SEO. Having a false business address, incorrect phone number or an address and phone number inconsistent with that found elsewhere online can seriously, negatively affect your rankings. Having malware on your site can damage your local SEO. It is also important to avoid using PO Boxes, UPS Mail Store addresses, and other similar addresses. Google and other search engines will only recognize real addresses. If not properly overseen by an SEO professional, a website migration or relaunch project can create countless broken backlinks from other websites. This is a golden opportunity for recovering link equity. Some of the top pages on your site may have become 404 pages after a migration, so the backlinks pointing back to these 404 pages are effectively broken. Two types of tools are great for finding broken backlinks — Google Search Console, and a backlink checker such as Moz. In Search Console, you’ll want to review your top 404 errors and it will prioritize the top errors by broken backlinks. NOINDEX can be even more damaging than a misconfigured robots.txt file. Most commonly, the NOINDEX is set up when a website is in its development phase. Since so many web development projects are running behind schedule and pushed to live at the last hour, this is where the mistake can happen. A mistakenly configured robots.txt won’t pull your pages out of Google’s index if they’re already there, but a NOINDEX directive will remove all pages with this configuration. Most developers will make sure this NOINDEX is removed from your site, but if you’re having ranking problems, you should check this immediately. 90% of the time you’ll want it to be either “INDEX, FOLLOW” or nothing at all. If you see one of the above, you need to take action. If your web site is constantly being updated and improved by your development team, set a reminder to check this weekly or after every new site upgrade. The robots.txt file is a small text file that is placed on your website server that tells web crawlers like Googlebot or Bingbot if they should access a file or not. Improper usage of the robots.txt file can hurt your SEO ranking because the robots.txt file controls how search engine spiders see and interact with the pages on your website. Do I have a robots.txt file? You can check this from any browser. The robots.txt file is always located in the same place on every website, so it’s very easy to determine whether a site has one or not. Just add “/robots.txt” to the end of a domain name as shown below. If you have a file there, it is your robots.txt file. You will either find a file with words in it, a blank file, or no file at all. Is your robots.txt file blocking important files? When your developer creates your website, he or she will add code to the robots.txt file to make sure that it’s not indexed. This code is User-agent: * Disallow: /”. If your robots.txt file says this, you won’t appear in Google’s organic search results. If you see “Disallow: /”, talk to your developer immediately. There could be a good reason it’s set up that way, or it may be an oversight. If there’s content after the “Disallow: /”, then the robots.txt file could be set up correctly, but it warrants a discussion with your developer. If you have a complex robots.txt file, like many ecommerce websites, you should review it line-by-line with your developer to make sure it’s correct.